Zahra- Amrollahi, Radiation Protection Dep. of Atomic Energy Org. The overall approach to quality control (QC) of industrial centers during working with rays in Iran compasses health, safety, security and environment (HSSE). There is a firm goal to define evaluate and structure the necessary organization which will carry out the quality control programme (QCP) and insure that the radiography centers be reliable, safe and economical. This paper discusses the importance of the quality control (QC) on the job is analyzed to achieve the protection of human being, the overall safety of site radiography operations, their progeny, environment against the harmful effects of radiation that are associated with the various applications that ionizing radiation has been put to industry the most significant one is Non Destructive Testing (NDT) methods, like radiography. The use of radiation sources of various types and activities is widespread in industry, medicine, research and teaching increasing yearly. Among the various applications that ionizing radiation has been put to in industry the most significant one is non destructive testing (N.D.T) methods, like Dye penetrant test (D.P.T), Magnetic particle test (M.P.T), Eddy current testing (E.C.T), Ultrasonic flaw detection (U.F.D) and Radiography testing (R.T). Application of these methods are carried out for revealing surface and internal defects in a specimen. N.D.T method are complementary and selection of test method is always done, by keeping in mind the advantages and limitations of the N.D.T methods. But in case of doubt, assessment made by radiography is treated as final because the same is able to provide a permanent record. By using radiographic techniques and good welding procedure, it has been possible to upgrade the piece of work by repairing the defects. As mentioned above radiography method can be carried out by X-rays and Gamma rays. Non-Destructive testing or inspection (N.D.T or N.D.I) are the terms used to describe a wide range of testing techniques designed to produce information about the condition of a specimen without doing any damage to i.e. after the testing the fitness of the specimen for use in service is unchanged. In practice only a few N.D.T methods directly test a product for fitness for service or directly measure its mechanical or physical properties. Most N.D.T methods are flaw detection techniques. Thus, one finds a crack at a particular point in a welded structure and determines its length and height, but then it is necessary for someone to decide whether or not that particular crack will prejudice the performance of the structure. i.e. cause permeate failure. The term non-destructive evaluation, N.D.E ends sometimes used for this interpretation stage of the inspection process, but equally it can be argued that N.D.T ends at the stage where the flaws are quantitatively described, and the final stage is for the designer. Non-destructive testing is not limited to the finished/assembled stage of production; if materials are to be used to the limits of their strength to satisfy the demands of sophisticated equipment, N.D.T must be considered for incorporation at every stage of the design-production-service-maintenance cycle. Materials must be examined prior to construction; the design must be such as to enable efficient inspection during manufacture and in-service monitoring should be considered as a possible requirement. In recent years a new term has developed: "condition monitoring" or "machinery health monitoring"; this also uses N.D.T methods. The well-established of N.D.T methods are penetrant crack detection, magnetic particle crack detection ,eddy current testing and radiography; there are a dozen or more other methods which have more limited applications to special conditions or materials and new techniques are constantly being developed. Penetrant and magnetic inspection are essentially surface crack detection methods to increase the efficiency of surfaces; eddy current testing can detect internal flaws in thin material, but only radiography and ultrasonic testing can be applied to the detection of flaws anywhere through the volume of large masses of material. Each has advantages and disadvantages, and each requires considerable operator skill to use method to its best advantage. Non-destructive testing is a multi-disciplinary subject and as yet there are relatively few professionals adequately trained in the subject; the need for information dissemination, Particularly scientifically based data, is especially acute because of the relatively small number of well-trained experts in each particular field. One of an important kind of Non-destructive testing (N.D.T) is radiography technique. Industrial radiography has developed steadily for about sixty years, and as the manufacturers of equipment have broadened the range of their products, a large variety of possible techniques has become available, with a wide range of attainable flaw sensitivities. Generally, good radiographic inspection involves a careful compromise between a number of technique parameters and it is comparatively easy, through lack of knowledge, to use an unsuitable or insensitive technique. As mentioned above industrial radiography is widely used in detect of defect and examination of welds, castings, forgings, etc. It is as an effective quality control tool in the fabrication of complicated structures, bridges, boilers, pressure vessels, ship-building, air-craft construction manufacture of defense equipment, aerospace components and nuclear hard-ware. It is also finding increased application in the erection of thermal and nuclear power plants, oil refineries, pipe-lines, petrochemical complex, etc. as a maintenance tool, isotope radiography is used to determine the deterioration of materials and weldments in service. The technique is fairly simple and proven. And also, the use of radioisotope sources of radiation makes the application of the technique cheap, convenient, accurate, reliability and trouble free in operation. 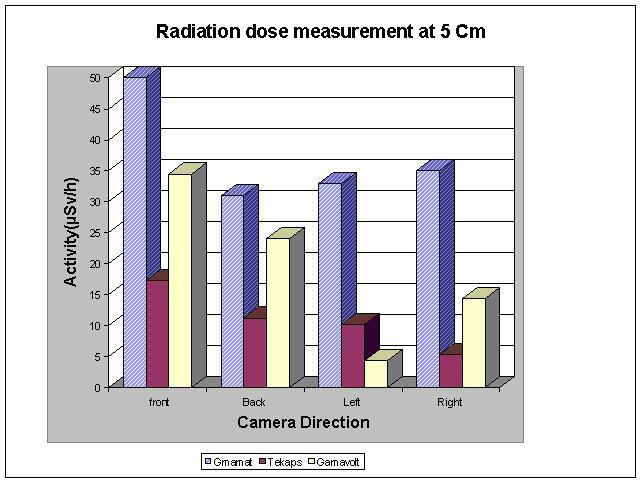 However potentials of applications of the penetrating radiation are not realised or exploited fully in film radiography. The films used in the industrial radiography are of special type called X-ray films and usually the emulsion is coated on both the surfaces. The films can be classified as extra fine grain, fine grain and coarse grain type depending upon the applications. 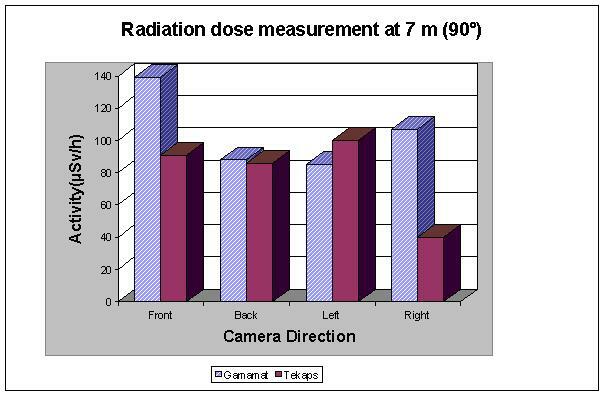 The film radiography quality is essentially a function of two factors viz., the sensitivity. Usually the density is associated with the contrast obtained and for quality radiographs the desirable density limit is in the range of 2 to 3. The sensitivity is measured by done with the aid of Image Quality Indicators (IQI) commonly known as penetrameters. They are usually small metal strips or wires, usually of the same material as that of the test object and placed on the component. By observing the images of these penetrameters on the radiograph, the sensitivity of the radiograph is determined. Usually for normal applications a minimum sensitivity of 2% will be prescribed which can be reduced to 1% for special applications. Thus, the procedure is also called quality control (Q.C) testing. The use of radiation sources various types and activities is widespread in industry. 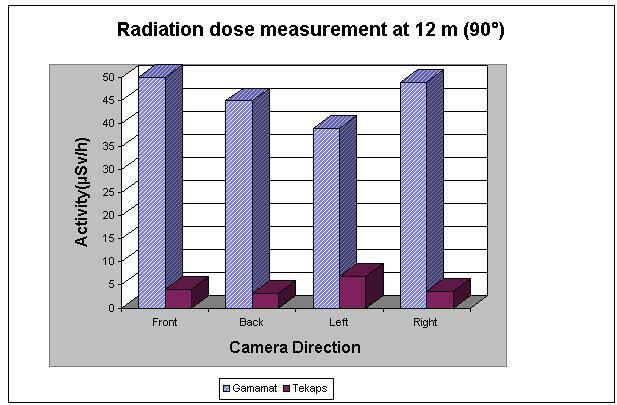 The radiography's cameras in which the industrial isotopes are kept must radioactive isotopes for industrial radiography purposes. Radiography testing can be carried out by X-rays and Gamma rays. There is a wide choice of satisfactory radiation energy although there is a optimum radiation energy for a given thickness. 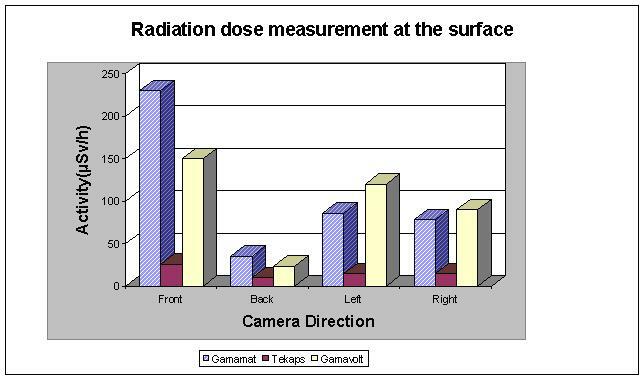 Optimum radiation energy depends mainly on thickness range covered on each radiography and the micro-structure of the object. Due to the necessary equipment is highly portable and ideal suited to the sometimes remote and often difficult working conditions on construction sites. Generally we are using Cobalt(Co-60), Cesium(Cs-137) and Iridium(Ir-192) in the radiography. Iridium-192 is ideal for radiography but other radionuclides can used depending on the characteristics of the object material. The energies of these radiation source are given in the table-1. Radiographic sealed sources are special form, stainless steel capsules containing a high activity. A shutter-type container consists of a block of shielding material at the center of which the source is located.A portion of the shielding can be removed or rotated to expose the source, thus acting as a shutter.Due to the weight of shielding, this type is only practicable for use on site with relatively low energy or small activity sources. A projection-type container consists of shielding material with an internal tube so that the source when not in use shielded within the container. The principle of the simplest S-type in figure2. Use of manual extraction source exposure containers is not recommended. Experience has shown that the doses received by operators for the same work load can be significantly higher than those received by the operators of types (a) and (b) above. 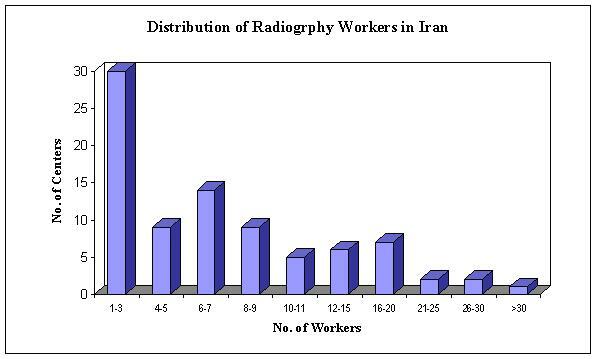 Measurements were made on radiography centers at the various part of Iran during radiography testing, while a series of radiographic examinations were carried out. In all measurements were made on 57 who had examined a total of about 650 staffs in 53 radiography centers. And, also assessment and evaluation were made on a number of radiography centers which had examined on various types of methods with difference radiographic exposure devices were designed to house and secure the radioactive source and source holder assembly, provide appropriate shielding around the source provide a means for manipulating the source holder assembly from a shielded position to an exposing position and back. Before qualifying a device for a specific application, there should be assurance that the method has been properly selected for that application. 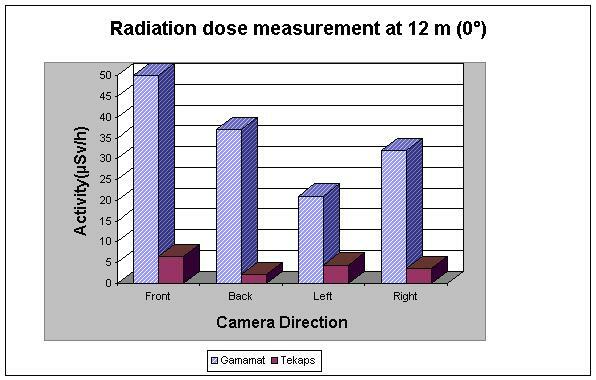 The results of direct dose measurement in unit of Micro Sivert per hour (uSv/h) in different distances, direction of source and angles (surface, 5cm, 1m, 7m (0') and (90'), 12m, (0') and (90') of application to three typed of radiographic exposure devices: Gamamat, Tekaps and Gamavolt according to as mentioned above methods are shown in Tables (1 to 7)and determined the distributions of ordinary camera uses in Iran (table 8). 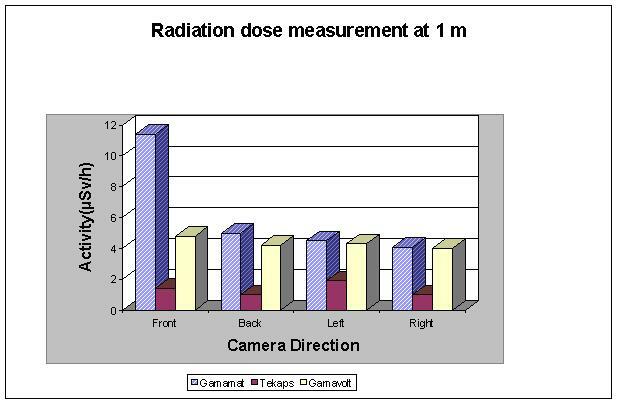 The results indicated that the average exposure level represents a radiation dose with compare the data of this measurements in the personnel with post university qualified trained staff level 5 times lower than the persons with no grade or primary of education (Fig.9). But it was found that the exposure rate of staff may depending on the level of their education and quality culture. So, it is essential to prevent and monitor radiographic risks, from its design its operation, including quality control system to be procedures, documented, implemented, maintained and qualified training program. Radiography is an important non-destructive testing technique extensively adopted by the heavy industries all over the world. The technique is quite simple to operate and economical. 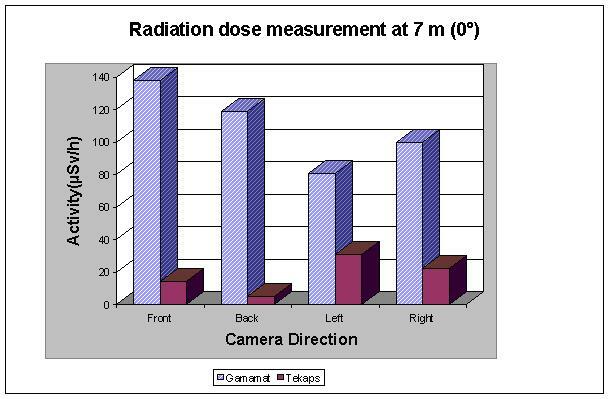 Advantage of this technique lie on require electric supply and due to the portability of the camera, this can be brought to the job of inspection at any height and therefore most applicable and suitable for field radiography work where the use of X-ray equipment is not practical. However, one aspect of caution to be exercised during the handling of radioisotopes is the radiation hazards. Provided adequate precautions are taken at the time of transport and utilization of the isotopes, there is no cause to worry. The personal and the place of work are to be strictly monitored for radiation safety as recommended by International Commission Radiation Protection (ICRP) and World Health Organization (WHO) for As Low As Reasonably Achievable (ALARA) principle of precaution target. Therefore, it is necessary a culture of radiographical protection based on the principle of optimization to the management of a company modifies both the active philosophy and behavior of that company. The dissemination and good practice of a radiographic protection culture will probably be determining factors in the improvement of communications and nuclear risks by the public.